WHAT IS GENERAL TSO’S SHRIMP AND BROCCOLI? General Tso’s is normally a sweet, somewhat spicy chicken dish served in Chinese buffets and restaurants across the United States. It was created as an American Chinese dish, meaning it is not a traditional Chinese food. You might have even seen the name spelled differently (Tao, Tzo, Tsao). However, the food and taste is still the same. The dish is reportedly named after Tso Tsung-t’ang, a Chinese military leader and statesman from the Qing dynasty. Oddly enough, he had no actual influence on the dish. While normally associated with breaded, fried chicken, the General Tso’s sauce is gaining popularity with a variety of different meats. There is now General Tso’s beef, chicken, shrimp, pork, and for the vegetable lovers, often used as a garnish for cooked vegetables. 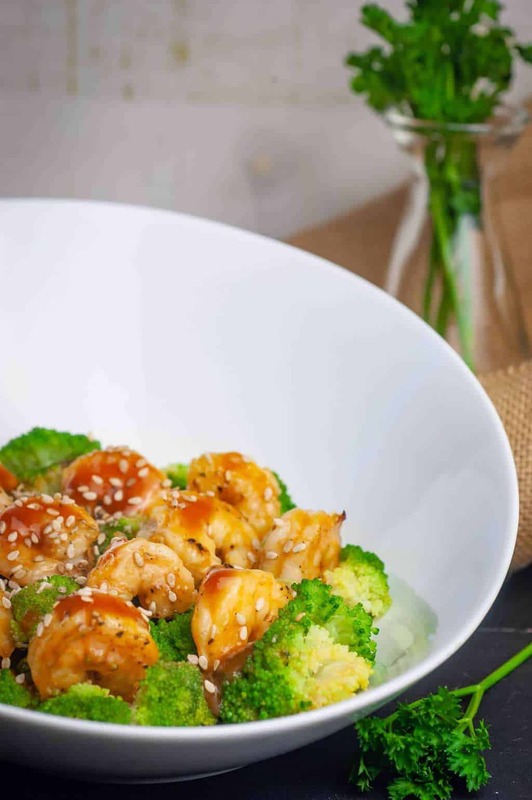 This low-carb General Tso’s shrimp and broccoli is tossed in a delicious homemade sauce and can easily be served with cauliflower fried rice or another low-carb/keto side dish. WAIT… HOW DO YOU PRONOUNCE TSO CORRECTLY? Before making this delicious and spicy Asian-inspired dish, make sure you have the following ingredients on hand. After you have all of these ingredients, you’re ready to get cooking! In a skillet over medium heat, combine garlic, liquid aminos, vinegar, sweetener, and ketchup. Bring the mixture to a boil, then turn off heat. Separately, steam broccoli until tender in a large pot fitted with a rack or steaming attachment. While the broccoli is steaming, in a medium mixing bowl, season shrimp with salt and pepper. Heat a separate skillet over medium-high heat and add olive oil. Cook shrimp until translucent and cooked through. Spoon sauce over shrimp and stir-fry until slightly caramelized. Garnish with optional sesame seeds. Serve on top of steamed broccoli and enjoy! Even though this is a sweet and spicy dish, the spice can certainly be whatever level you desire. Below are a few ideas of ways you can easily adjust the spice level of this dish to meet your individual tastes and preferences. To make this dish less spicy, start by using 1 teaspoon (instead of a tablespoon) of the crushed red pepper. Work your way up, by 1/2 teaspoons full of the pepper, until the desired “heat” is reached. If you prefer your dish less spicy, perhaps start (and stay) with the 1 tsp of crushed red pepper. Remember, you can always add more, but you can’t take it out! If you add the full 1 tablespoon of pepper (or use the incremental addition method as described above) and you still aren’t satisfied with the level of heat provided, adding more crushed red pepper is your first “best bet” to reaching your desired level of heat. The way by which you add more red pepper to the desired level can be up to you. The safe method is using the incremental method, which is described above in the “Making It Less Spicy” section. This method adds 1 teaspoon at a time to the recipe until you reach the level of “hot” you want. Another way you can add some heat is to add a 1/4 tsp of hot chili oil to the sauce mixture as it is cooking. As the name implies, this oil is spicy and can add some serious heat to whatever you are cooking. 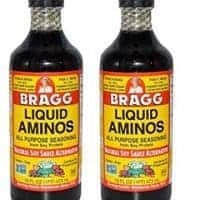 I recommend adding it in 1/4 tsp increments only, as a little of this oil can go a long way. Just like other flavored oils, it can become overpowering in both taste and spice quickly. Experimenting with this oil in other dishes is a great way to get an understanding of how much of the oil you like to use and how the taste affects the food. BUT I THOUGHT KETCHUP WAS OFF LIMITS? As a general rule, regular ketchup is chock full of added sugar and carbohydrates. As you know, it is generally highly frowned upon for anyone following a low-carb or ketogenic diet. In fact, 1 tablespoon of regular ketchup can have anywhere from 5g – 8g of carbohydrates in it. Thanks to the rise in reduced-sugar diets, companies have begun to manufacture different varieties of ketchup that are lower in sugar. This recipe mentions using no-sugar-added ketchup, which should be readily found in your local grocery store or supermarket. Depending on where you live, you might also see other variations that include sugar-free, reduced-sugar, and sugar limited.These kinds of ketchup are formulated to be simpler (fewer ingredients since there are no sweeteners) and lower in sugar. The no-sugar-added ketchup we use has 1g of carbohydrates per tablespoon, which is much better in comparison to normal ketchup. Because of this, these kinds of ketchup are acceptable in small portions while on a carbohydrate limited diet. DO NO-SUGAR-ADDED KETCHUPS TASTE THE SAME AS REGULAR? In our opinion, they do taste the same. I think getting used to using ketchup without sugar is very easy. The main difference you will taste is a slightly more acidic taste in the reduced-sugar option. This, of course, is due to the acidity in the tomatoes. The addition of sugar helps to mask this, which is probably why tomato ketchup has so much added sugar to begin with. Truly, you won’t notice much, if any, the difference in the two. This is especially true when considering this recipe also calls for the addition of a sweetener. WHAT ABOUT MAKING THIS RECIPE WITH CHICKEN INSTEAD? Should you wish to make this dish with chicken instead of shrimp (or in addition to the shrimp, if you’re feeling adventurous) you can easily do so. Here are a couple ideas for you if you’re wanting to switch the shrimp for chicken to make this dish exactly what you want. To keep this dish low-carb, using chicken breast is the easiest and quickest cut of chicken to use. Chicken breast is lean, has 0g of carbohydrate, and is readily available at your local grocery store or supermarket. You can even use chicken tenders or chicken chunks, should these cuts be available in the store. Chunks are normally chicken breasts that have simply been pre-cut into chunks for convenience. If you’re wanting this chicken substitution to be low-carb but also more keto, read below for information on the cut of chicken to use to do that. Cut the breasts/tenders/chunks into bite-sized chunks and cook in a skillet just like the shrimp. After that, continue to follow the recipe as written. Boom! Now you have this dish with chicken, instead of shrimp. And, it’s still wonderfully low-carb. Eating keto means eating higher levels of fat. If you are planning to use chicken in this dish instead, chicken breast is one of the go-to chicken cuts. However, chicken breast is very lean and therefore has a very low fat content. If you’ve been eating keto for long, you know that chicken thighs are a go-to meat since they are higher in fat content than chicken breast. For comparison, chicken breasts have 3g of fat while chicken thighs have 11g. Not a huge difference, but a useful one for those who are looking to eat a higher fat, moderate protein diet. If you decide to spare the shrimp and “go keto” with this recipe, buy boneless, skinless chicken thighs. They will be much easer to deal with than the bone-in, skin-in variety. Should you not have access to boneless, skinless thighs for some reason, make sure to remove the bone and the skin before doing anything else. Cut the thighs into bite-sized chunks and cook in a skillet just like the shrimp. After that, continue to follow the recipe as written. Voila! You have a more ketogenic dish with chicken instead of shrimp! WHAT ABOUT THOSE RED CHILIS I’VE SEEN IN THIS DISH BEFORE? Red chili peppers are used in lots of Chinese dishes both spicy and non-spicy. Obviously for spicy dishes, they are used to add an additional type and layer of spice. For non-spicy dishes they are used in, they are generally used for a visual element thanks to their red, waxy coating. But what about using them in this dish? Dried red chili peppers can be found in both grocery stores and Asian supermarkets everywhere. Using them to add another layer of spice to this low-carb General Tso’s shrimp and broccoli is a wonderful idea! Before using them, hydrate the peppers by soaking them in warm water for at least 10 minutes. Add the hydrated peppers to the sauce during cooking or after the sauce has been added to the shrimp and voila! Red chilis successfully added! SHOULD I CUT THE PEPPERS? That’s definitely a personal choice on your behalf. If you are using the red peppers solely for dish presentation purposes, there is no need to cut them. In fact, even if using them for spice purposes, they will impart some flavor and spice to the dish without cutting them. While they are cooking in the sauce, they will release some flavor. Having said that, if you are someone who absolutely loves spice in your food, cutting the pepper either in half or into small pieces is definitely for you! If you have experience using red chilis in your cooking, then you are familiar with the amount of spice they offer and how much you need to use or can tolerate. Similarly, if you’ve never used red chilis before and plan to use them for a true spice element, we suggest taking it easy to start. See how you like the spice of the pepper first before adding too many. As the saying goes, you can add more later, but you can’t take away. CAN I USE THE SAUCE BY ITSELF FOR OTHER RECIPES? Yes, you sure can. Just cook the sauce by itself and add it to whatever dish you want to. If you’re looking for a way to create a light, yet Asian-inspired meal, combine the Tso’s sauce with our Keto Cauliflower White Rice. This will give you a spicy rice that is delicious, without all the “heft” of adding a meat to it. It also creates a wonderful dipping sauce or glaze for vegetables. You could even cook this dish, but leave out the shrimp. 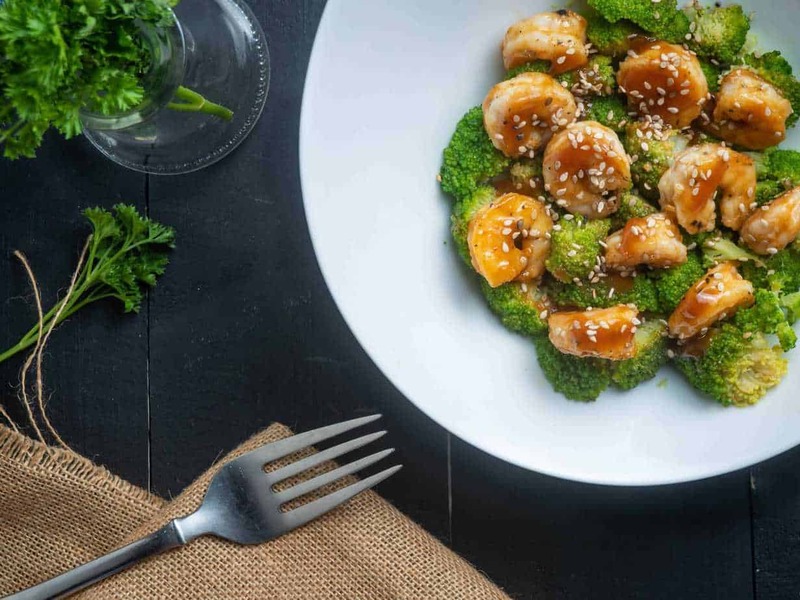 This will leave you with a yummy General Tso’s glazed broccoli that is perfect as a snack, side dish, or meal all by itself. WHAT PAIRS WELL WITH GENERAL TSO’S SHRIMP AND BROCCOLI? There are several sides that pair well with this delicious main course. Of course, they are all Asian-inspired and super yummy! Have a recipe you love as a side dish for this low-carb General Tso’s shrimp? Let us know in the comments below! Want even more Asian-inspired awesome? Pour some of our Keto Yum-Yum Sauce over for more deliciousness! Non-Stick Skillet – A good non-stick skillet is a must-have in any kitchen. For this particular recipe, having a few different sizes of non-stick skillets on hand will make it so much easier on you! If you don’t have at least one non-stick, consider getting one to have as a staple item in your cooking arsenal. General Tso’s chicken is a staple of Chinese cuisine but full of sugar. 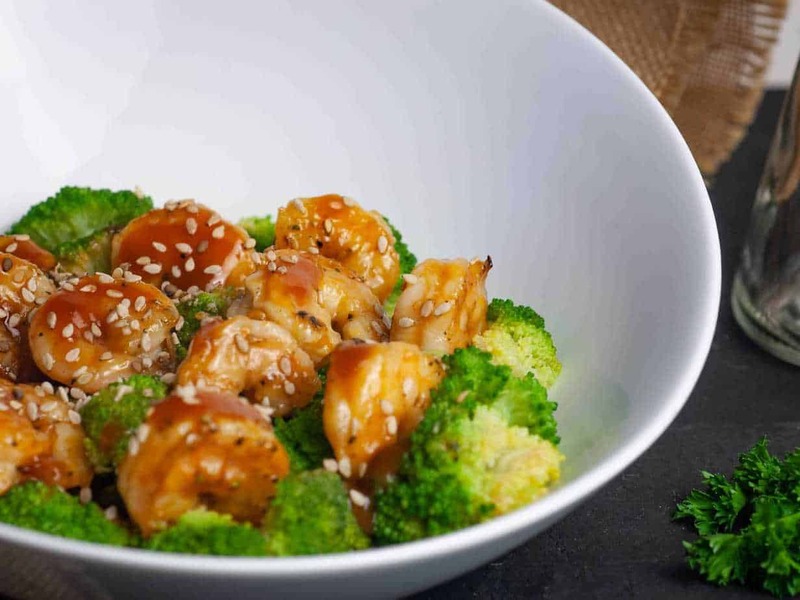 This low-carb General Tso’s shrimp and broccoli is just as good and tasty! I’m wondering what I can use instead of the ketchup? Sugar free ketchup (or tomato sauce) is hard to come by in regional Queensland, Aust. 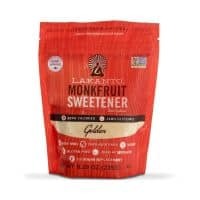 As is monk fruit sweetener. I’m currently using xylitol which while not ideal, tastes a 1000 x better than stevia. Thanx for any help. I’m really looking forward to trying this recipe. If you have tomato paste, you can use a small amount (1 tbsp or so) and mix it with water until it’s a ketchup consistency. Add a little salt and you’d be set! As for the sweetener, whatever sweetener you have on hand would be fine. We are so glad you enjoyed it! Thanks so much for commenting and letting us know!